Definitely in my top 3 comedy podcasts. Roll on the floor laughing to this one. So funny and entertaining! It's addictive! The lead single off Bermut Nundaloy’s full-length album Bermiful Nelodies. Music by Shane O’Connell. Lyrics improvised by Seth Lind. The whole album can be yours when you support Mission to Zyxx in the upcoming MaxFunDrive! And please Join the crew on March 17th at Littlefield in Brooklyn for the Season 3 kickoff show! Tickets at missiontozyxx.space. Open your hangar bays, because we’ll be back March 20th with Season 3! And get this: We’re now part of the Maximum Fun podcast network. We are tremendously pumped to join such a great roster of shows, on a fan-supported, artist-owned network. Or as C-53’s pelvis would say: Let’s P-p-p-p-party! Nermut gets a promotion. Featuring: Jeremy Bent Alden Ford Allie Kokesh Seth Lind Winston Noel Moujan Zolfaghari John Robert Wilson Edited by Seth Lind Recorded at Braund Studios by Shane O’Connell Sound Design and Mix by Shane O’Connell Music by Brendan Ryan Opening Crawl narration by Jeremy Crutchley Ship design for the Bargarean Jade by Eric Geusz Thank you to everyone for listening to Season 2! You’re the best! The crew heads to the planet Mehnah in search of a star with precious intel. Dar meets someone from their past. Pleck gets some sludge. C-53 lays down a beat. Featuring: Jeremy Bent as C-53 Alden Ford as Pleck Decksetter Allie Kokesh as Dar Seth Lind as Nermut Bundaloy Winston Noel as Beano, BouncerBot and Little Bill Moujan Zolfaghari as Bargie and Miranda With special guest Yoni Lotan as Pee-Nee Gorno Edited by Seth Lind Recording, Sound Design and Mix by Shane O’Connell Music by Brendan Ryan Opening Crawl narration by Jeremy Crutchley Ship design for the Bargarean Jade by Eric Geusz Additional crowd SFX from our amazing Season 2 premiere show crowd at Caveat in NYC. Thank you! The crew is tested by a mysterious stranger. C-53 thinks outside the box. Pleck faces an existential dilemma. Beano know. Featuring: Jeremy Bent as C-53 Alden Ford as Pleck Decksetter Allie Kokesh as Dar Seth Lind as Nermut Bundaloy Winston Noel as Beano Moujan Zolfaghari as Bargie With special guest Jonathan Braylock as Two Edited by Alden Ford Recording, Sound Design and Mix by Shane O’Connell Music by Brendan Ryan Opening Crawl narration by Jeremy Crutchley Ship design for the Bargarean Jade by Eric Geusz Additional audio from our NYC and LA live show audiences. Thanks for your help! To celebrate our upcoming Los Angeles Live show July 29th, please enjoy this bonus release of our first-ever live episode, recorded at the amazing Caveat NYC on November 6, 2017, and originally released exclusively to our Patreon supporters. Take a trip back to a simpler time, when restraining bolts were in place and the Federated Alliance was for hailing, not jucking. The crew is send to the textile planet Philcon to pick up new ambassador uniforms for the Alliance. Bargie celebrates an anniversary. Nermut gets into art. Pleck gets a new ‘do. Featuring: Jeremy Bent as C-53 Alden Ford as Pleck Decksetter Allie Kokesh as Dar Seth Lind as Nermut Bundaloy and Phil Winston Noel as CLINT and Phil Moujan Zolfaghari as Connie With special guest Jeff Hiller as Bruce the glam droid Recorded Live at Caveat NYC by Shane O’Connell LIVE Sound Design and Mix by Shane O’Connell Music by Brendan Ryan Opening Crawl narration by Jeremy Crutchley Ship design for The Bargarean Jade by Eric Geusz If you’re in LA, please join us for our live show July 29th featuring returning special guest Jon Gabrus! 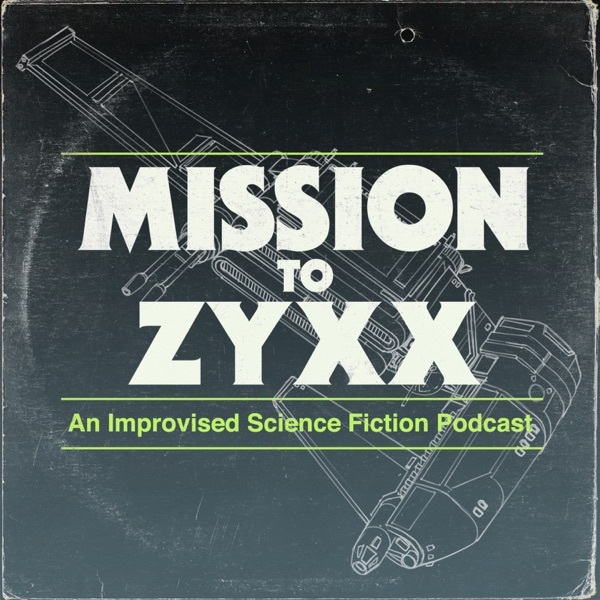 And if you’d like to hear more of our live shows, as well as mailbag episodes, behind the scenes video, ringtones and more, join us on our Patreon page at patreon.com/missiontozyxx ! The crew responds to a distress signal from the long-haul cruiser Dezel Maschh. Bargie goes hatch-to-hatch. C-53 takes some photos. Allen goes to the checkup. Featuring: Jeremy Bent as C-53 Alden Ford as Pleck Decksetter Allie Kokesh as Dar Seth Lind as Nermut Bundaloy Winston Noel as the Dezel Maschh Moujan Zolfaghari as Bargie & Mel With Special Guest John Robert Wilson as Allen Edited by Seth Lind Recording, Sound Design and Mix by Shane O’Connell Music by Brendan Ryan Opening Crawl narration by Jeremy Crutchley Ship design for the Bargarean Jade by Eric Geusz Special thanks to listener Rebecca Pridmore for additional foley! Episode 118: The Delegator [Season One Finale] Nermut gets a promotion. Featuring: Jeremy Bent Alden Ford Allie Kokesh Seth Lind Moujan Zolfaghari Winston Noel Edited by Seth Lind Recorded at Braund Studios by Shane O’Connell Sound Design and Mix by Shane O’Connell Music by Brendan Ryan Opening Crawl narration by Jeremy Crutchley Ship design for The Bargarean Jade and Finale Art by Eric Geusz Huge thanks to everyone who has listened to our first season!